Congratulations to Clifford Whittaker – who this week celebrated living with type 1 diabetes for 80 years. 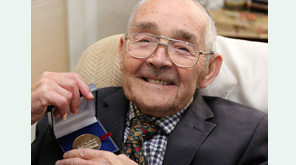 The Essex pensioner received an HG Wells medal from Diabetes UK in recognition of how long he has lived with the condition. Mr Whittaker told the BBC he had never allowed his diabetes to stop him from doing anything and that his late wife Doreen had played a part in keeping him healthy over the years. He was diagnosed with type 1 diabetes at the age of 8 and only stopped driving two years ago. Sharon Roberts of Diabetes UK said Mr Clifford was an inspiration, showing people that it was possible to live a long life with diabetes if you managed your condition well. Read the full story here. Pic thanks to Diabetes UK. If you want help managing your diabetes for great blood sugar control, check out the Diabetes Diet.